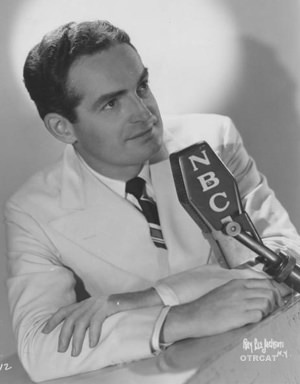 Although most of these Fred Waring shows are from 1947 and 1948, Fred Waring and his orchestra were on the air for over three decades, from the 1920s through the late 1950s. Fred began his band in the 1917 with his brother and two others. They began by playing mostly college gigs while students at Penn State. His band grew with the years, and in 1929 he was asked to play at the Roxy Theater with an orchestra of 50 players. At the time he had a band of 20. He got the large group together and was such a success that he was booked at the Roxy for six months. Until 1929, Fred had only instrumental arrangements. This changed when he was asked to sit in for the sick conductor of the Hall Johnson Choir at the Roxy. He was so delighted with the results, he added a glee club to his orchestra. However, this was a hard sell to radio stations, and so he rejected 24 radio offers that asked him to do purely instrumental shows. Finally, he found a sponsor who would include voice in their program, and he began doing Chesterfield shows in 1939. This relationship lasted for five years and the band continued to grow. In 1945, he began a new radio show with a different station. The idea behind the show was to "bring nighttime quality to daytime radio. He did just that, and created one of the most expensive daytime old time radio shows of all time. $18,000 a week was paid to just the orchestra. Fred was known for being a perfectionist and he made his orchestra rehearse up to eight times a day. Many of the numbers they were to play on the air were rehearsed in three different styles - as a waltz, as a jive number, and in straight time. Band members had to be on their feet at all times, as they never knew ahead of time which version he would pick for the performance. 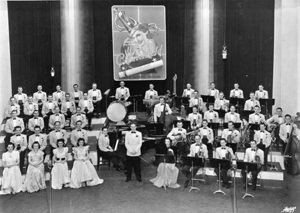 So if you are in the mood for some fine musical entertainment, day or night, sit back and enjoy Fred and his Orchestra, which was billed as "more than half a hundred Pennsylvanians." 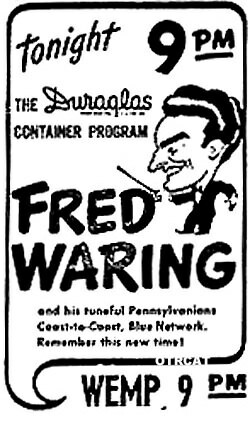 Be the first to comment on "Fred Waring"